The tips on this page will help you get rid of white head pimples faster and prevent new ones from forming! When you first see one appear – there is usually a small amount of inflammation. It’s never recommended to try to squeeze it now while it’s still forming. Any attempt will be in vain, and it will stick around for a lot longer and become a larger, uglier mess! If there is no inflammation (no redness or tenderness) – some are formed this way, and others lose all inflammation after the first day. The best way to get rid of a small whitehead is to pop it (believe it or not). There’s always advice against doing this but if squeezed right it can get rid of that spot a lot faster. If you deal with whiteheads often, there’s something in your skin care routine or lifestyle that is causing them. Assess your skin care – eliminate too-rich moisturizers, heavy sunscreens and thick makeup as these can clog pores. Follow your cleanse in the evening with an exfoliant to dissolve oil and dead skin cells, which takes care of existing whiteheads and prevents new blockages from developing. Where on your face are they forming? This can be important! Take note of where most whiteheads are appearing on your face – around the hair line can be from not rinsing shampoo thoroughly. Sides of the face can be from using a phone or not changing your pillowcase regularly. YOU MIGHT LIKE: What To Do When You Feel A Pimple Coming! The ‘white’ pustule is caused by a build up of dead skin cells and oil inside a pore. Good bacteria normally on the skin’s surface turns “bad” here and multiplies. These spots aren’t formed deep in the skin like blind pimples. Instead they usually start out as a blackhead type blockage and turn white when the pore opening is covered. This makes them easier to treat than blackheads. Because the opening is never covered on a blackhead pus never forms – which means they can stick around indefinitely. Either by erupting onto the skin’s surface or dissolving it inside the pore. There’s usually minimal inflammation due to containment of the pus, and this doesn’t affect the surrounding tissue. White head pimples are fairly easy to treat as they don’t have a lot of inflammation. They go away on their own if left alone – unlike blackheads. However this doesn’t mean they are any less common and annoying. The tips on this page can help you to get rid of them faster, and to prevent further ones from breaking out on your face! 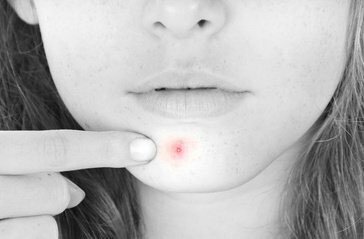 NEXT: What Causes Pimples? The Truth Will Clear Your Skin! My face looks like a potato because it has so many pimples spread across my skin! Thank you for letting me know that using clay can dry out pimples! I’ll need to try that tonight. Along with trying your tips, I want to find a good place I can go to for acne care. I’ve been battling this for a while, and I feel like it’s time to take control. I totally feel your pain. I’ve been battling severe cystic acne for months now. And I finally found the culprit: Candida Overgrowth in the Gut. I researched the ton out of it and it turns out the acne is just a SYMPTOM. Just like how Chronic Sinusitis, and constant sinus issues, are actually just a SYMPTOM of Candida Overgrowth, something I’ve also suffered for years. These are both symptom of the guts good and bad bacteria being out of balance. And the reason it goes out of balance – meaning too much bad bacteria and not enough good bacteria to keep it under control – is usually due to antibiotics, and a diet full of refined sugars, processed foods, and any other food or drink that the bad bacteria feeds off of which makes it multiply out of control. The antibiotics kill the good along with the bad bacteria. It’s a vicious cycle, if you think about it. That’s why acne medications and treatments NEVER WORK. Because A: it’s treating the symptom, not the cause, B: those antibiotics and other prescription meds kill the good bacteria which is responsible for preventing the skin from having issues in the first place, and C: most people have a diet where they are eating breads, rice, drinking eating dairy, etc… You can treat the acne, but unless you get to the source and kill the yeast overgrowth, you’ll just keep getting it and it is a never ending battle. I highly recommend Lauricidin to kill the yeast overgrowth – absolutely NO side effects as it is not a drug – it is a highly concentrated compound of coconut oil. It was actually created by a doctor. I recommend you read about it, how it works, and then after about 10-15 days, take Dr. Ohhira’s probiotic – possibly the best probiotic I’ve yet to see due to how he makes it. Because basically, you’re going to kill off the yeast overgrowth, and then you’re going to introduce the good bacteria back into your gut, restoring balance to your gut flora. And try to reduce anything from your diet that will feed the yeast overgrowth, while you’re trying to get your gut back under control. Google foods that contribute to Candida overgrowth, for a full list. You may experience “die-off” symptoms during those 10-15 days, and that is simply the toxins leaving the body (although you really shouldn’t experience anything major, maybe a tiny tummy ache or headache) I didn’t get anything other than more acne because that is one way the toxins leave the body. But it’s only a few days, and the important thing is you’re treating THE SOURCE. I wish you all the best, and I hope this helps you.